Whether through fitting you with eyeglasses or contact lenses, diagnosing and treating glaucoma cataracts, dry eye and other eye diseases, or suggesting LASIK and other eye surgeries. Our expert optometrist and friendly staff will take the time to answer all of your and your family's questions, explain vision treatment options, and provide the highest quality eye health treatments that fit your unique personality and lifestyle. 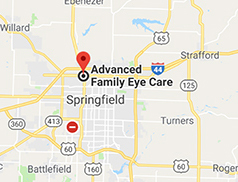 Built on the foundation of patient convenience and satisfaction, Advanced Family Eye Care serves all of your family’s eye care needs under one roof, including a wide array of designer eyeglass frames in our on-site frame gallery, which is open every day of the week. We're looking forward to your visit to our modern facility and friendly doctor and staff! Contact us today to schedule your next eye exam. Dr. Cook and his staff are knowledgeable and friendly. The eye exam is the best I've ever had,very in depth and different than the same routine of other eye care places. They have an excellent selection of frames. So glad I found them years ago. I’ve been using Advanced Family Eye Care for nearly ten years now and will continue to do so for many more years. Dr Cook is aways friendly, timely and I repeatedly have an exceptional experience with my prescribed lenses. The office staff is great as well. They are consistently welcoming, professional and personable. I am so impressed by the friendly, warm atmosphere of this clinic! I am absolutely going back and recommending Advanced Family Eye Care to friends. The staff is top notch!